Starting in 2008 the Republic of Ireland1 experienced its deepest economic crisis. The severe recession caused by the property crash, insolvent banks and the Irish sovereign debt crisis and resulting in the bailout by the troika of the IMF, ECB and EU Commission has dominated economic commentary since. Yet the 'ele­phant in the room' in the seemingly endless debate on the scale of the fiscal adjustments required is from where over the next decade economic growth is going to originate? Clearly, the faster Ireland grows as an economy the more sustainable the debt. By investigating the sources of growth for the past five decades, the book contributes to our understanding of the growth prospects of the country in the medium to long term. Ireland is a small country of 4.6 million inhabitants in one of the most prosper­ous regions of the world. Its economic record has consistently attracted international attention. In 1987, after more than a decade of underperformance, The Economist magazine referred to Ireland as 'the poorest of the rich' (1988). Ten years later, in the middle of the so-called Celtic Tiger boom the same magazine referred to it as 'Europe's shining light' (1997). By the early 2000s Ireland had a level of per capita GDP that was second only to Luxembourg in the EU. There was considerable interest from emerging countries in Eastern Europe and elsewhere as to the cause of the Celtic Tiger. In 2004 The Economist ran the headline 'the luck of the Irish' (2004), which perhaps reflected the emerging view that Ireland's formula for success may not be easily replicated. The recession after 2007 was the most sudden and severe in the history of the state. Between 2007 and 2011 Ireland experienced one of the most severe downturns of any industrial country (Honohan, 2010). Despite the current crisis, from the vantage point of 1970 Ireland's sub­sequent economic development has been transformative. In 1970 Irish living standards were 61 per cent of the UK level, its nearest neighbour and most important trading partner at the time. Irish exports were a mere 18 per cent of GDP and 25 per cent of the workforce were engaged in agriculture. Between 1970 and 2011, allowing for inflation, Irish living standards have risen by 158 per cent or 2.3 per cent per annum. In 2011, despite the recession, living stand­ards were 74 per cent of the EU 15 average;2 exports were 103 per cent of Irish GDP; and only 5 per cent of Irish workers were in agricultural employment.3 More tellingly, over the last decades Ireland has been increasingly identified as one of the most successful destinations in the world for foreign direct invest­ment. At the present time it hosts many of the world's leading businesses, including Apple, Intel, Google and Pfizer. In 2010, 80 per cent of Irish exports were from foreign-owned businesses assisted by IDA Ireland,4 mostly of US origin (Barry and Bergin, 2012). This book is about the economic development of Ireland since 1970. It offers a fresh narrative on the spectacular rise and fall of the so-called Celtic Tiger economy. 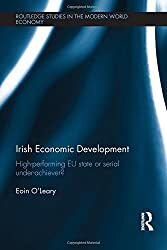 Guided by the theoretical framework which proposes that economic development is driven by business development, the book articulates an original account of Ireland as a micro-state with a unique reliance on foreign direct investment. Its highly centralized government's pre-disposition to lobbying, which has yielded some notable successes and failures internationally, has also coincided with undue influence from distributional coalitions inside the country which have periodically undermined growth and development. By uncovering the drivers of business competitiveness at the industry, regional and institutional levels, the book reveals a discerning account of Ireland's highly distinctive eco­nomic development path and weighs up whether Ireland will return in the next decades to be a serial under-achiever or a high-performing EU state. It is not possible to be discerning about the economic development of Ireland over the last five decades by relying exclusively on one theory. This is due to the necessity to inquire into a range of issues that will be shown to be important for an understanding of Ireland's unique development trajectory over this period. These include the strong reliance on multi-nationals, the small size of the country and the way government functions. As a result, an eclectic mix of theories is invoked. Rather than using theory as prescription, the approach taken is to stand back and use it as an organizing framework in order to develop a narrative that is both perceptive and comprehensive. Along the way a range of theories is appealed to and, where possible, evidence from the testing of hypotheses associ­ated with these theories is introduced in order to support the narrative. In addi­tion, gaps in knowledge, resulting from a lack of evidence from investigating particular theories, are also identified. The theoretical framework used draws on the works of leading thinkers, both contemporary and historic, in the area of economic development as it might relate to small countries. These include Porter (1990a), Schumpeter (1934), Solow (1956), Kuznets (1966) and Olson (1965). In terms of Irish economists, while there are many prominent contributors, the book is significantly influenced by the work of Kieran Kennedy, who was the lead author of the last compre­hensive book on Irish economic development (Kennedy et al., 1988). The work has also drawn from a range of other economists, regional scientists and political scientists who have written about Ireland over the past 50 years. This chapter first sets the scene by presenting the spectacular rise and fall of the Irish economy. It then outlines the theoretical framework that guides the book. Considering the process of economic development as hinging on business development suggests that in order to understand the performance of the country one needs to focus on the productivity of those businesses. This is influenced by sources internal to the business but also by the external environment in which they function. The next section briefly describes the method of inquiry followed. The chapter concludes with an overview of subsequent chapters.